The ancient city of Bakkah (yes, we’ve spelt that right!) was located in the mountains in western Saudi Arabia. 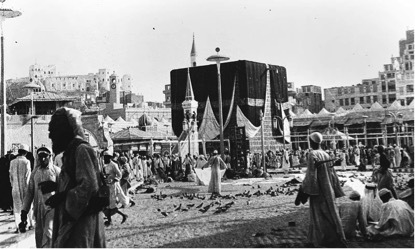 Later named Mecca, it is the holiest city in Islam, followed by Medina in Saudi Arabia, the City of the Prophet, and then Al Quds (the Arabic name for Jerusalem). Mecca is the city where Prophet Mohammed (peace be upon him) was born and where he first received revelation while worshipping in the cave of Hiraa’. 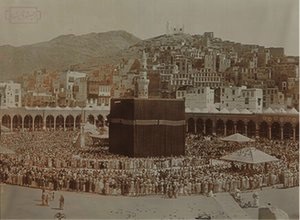 Mecca and the surrounding region have changed enormously over the centuries and the transformation has accelerated in the last couple of decades. To make way for millions of pilgrims every year, the mosque has been expanded and transport facilities improved. 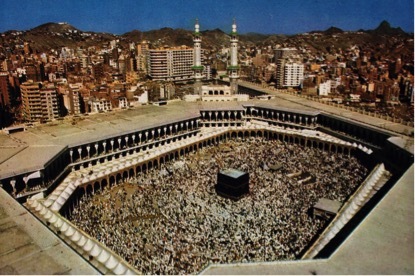 Mecca used to be part of the old caravan trade route linking Arabia with East Africa and South Asia. Under the rule of the Qurayshi tribe during the time of the prophet, the streets would have been buzzing with all kinds of languages! It used to be quite tough to get photographs of the holy mosque in Mecca, as non-Muslims are not allowed to enter the city and photography was banned – so reporters and filmmakers had trouble getting in. This is now rapidly changing. You can actually see the mountains at that time, which is pretty amazing! The mosque isn’t too packed, so doing tawaaf around the Kaabah must have been quite a stroll. 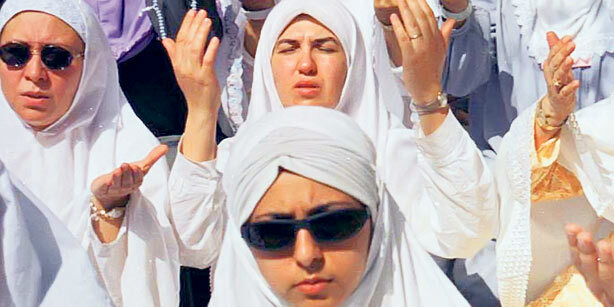 Arafat Day is named after Mount Arafat in Mecca. This is the day before Eid Al-Adha when Muslims are encouraged to spend the entire day in prayer and supplication. It’s also the day on which the sins of all pilgrims are washed away. 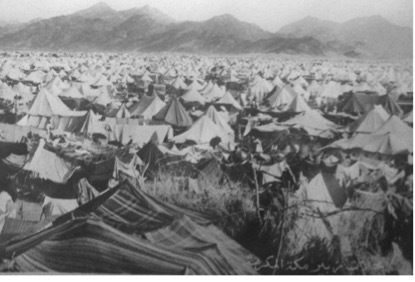 Here are the old-style tents people used to stay in on Arafat Day. 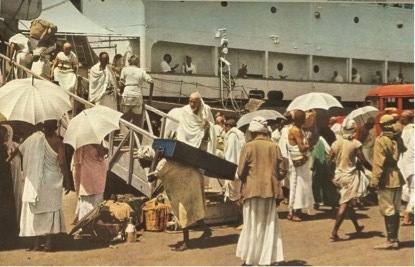 Before the age of air travel, pilgrims used to get to Mecca by boat and ferry. 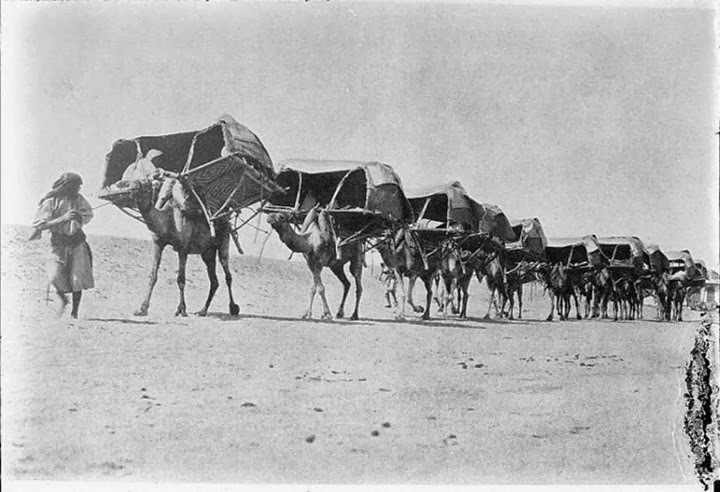 Prior to this, people used to journey together in camel caravans and would often stop to trade along the route. There’s so much going on in this photo – the annual replacement of the Kaabah’s cover, pilgrims walking in whatever direction they please, and the pigeons casually hanging out! 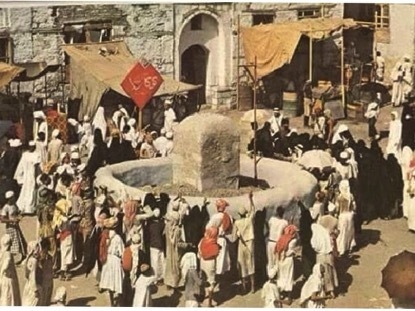 As part of the Hajj rituals, pilgrims are required to throw stones at three pillars representing the devil. Whereas now the pillars are enclosed in a structure with strict entrance and exit points, you can see they used to be in an open courtyard. 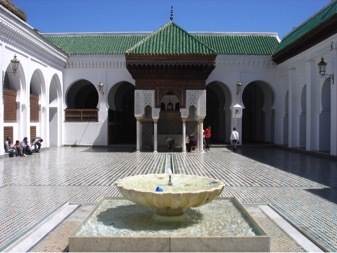 Here, the Grand Mosque with its low surrounding structures still has the atmosphere of the desert, and there’s less of the white marble that now characterises the mosque. 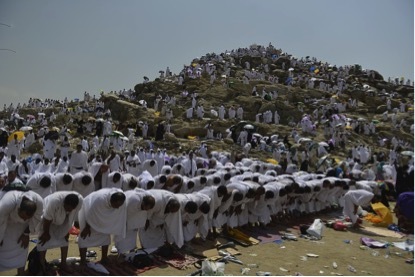 Here are pilgrims on Mount Arafat itself last year. Dealing with the heat and crowds is tough but many of the tents now offer air conditioning. This scene looks magical. 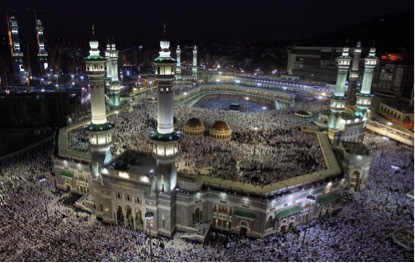 You can see thousands of people praying inside and outside the expanse of the holy mosque. The structure and lighting of the Grand Mosque has been completely transformed. May all your prayers be answered and have a very happy Eid this weekend. With Hajj 2016 season upon us, we’re all thinking of the fifth pillar of Islam and our obligation to fulfil it in our lifetime. Questions and answers here.